An Apprenticeship is an opportunity to learn real vocational skills whilst earning a real wage. An Apprentice will work towards nationally recognised qualifications through a combination of on-the-job learning and day or block release (depending on the employer requirements and the training provider). Both the Apprentice and their employer will be supported by a training provider throughout the Apprenticeship and there is often Government funding available to help pay for the training (depending on the age of the candidate). Recognised Apprenticeship frameworks exist in over 180 skill areas. A framework will usually include a range of qualifications such as Functional Skills (formerly Key Skills), an NVQ or practical qualification and a Technical Certificate (a more theoretical qualification). Apprenticeship frameworks and the qualifications they include are currently being reviewed under the new Qualifications and Credit Framework (QCF). An Apprenticeship can take between one and three and half years, depending on the qualifications studied and the vocational area. How do I get onto an Apprenticeship? You will need to register with the National Apprenticeship Service (NAS). To register go to: http://www.apprenticeships.org.uk and click on ‘Find an Apprenticeship’. What are the entry requirements (What GCSE’s will I need)? 4-9. This depends on the level of apprenticeship you are applying for. Grades of 4+ in Maths and English give you more opportunities. Progression after an Apprenticeship could be to a higher level Apprenticeship or to further academic/vocational study, including a full degree. Apprenticeships are open to all age groups above 16 years-old whether they are just leaving school, have been working for years or are seeking to start a new career. Apprenticeships are open to anyone living in England, currently not in full-time education or not holding a university degree. There are no set entry requirements for Apprenticeships and they can differ in different vocational areas. Entry requirements are flexible because Apprenticeships are not just based on academic achievement. Employers value enthusiasm for work and a desire to learn, so practical skills and interest in the chosen area are very important. There are over 190 types of Apprenticeships within a variety of industry sectors ranging from accountancy and engineering to veterinary nursing and floristry. Apprenticeship funding is available from the National Apprenticeship Service (NAS). This is paid directly to the organisation that provides and supports the Apprenticeship; in most cases this will be a learning provider. Large employers with a direct contract with the National Apprenticeship Service may receive the funding themselves. 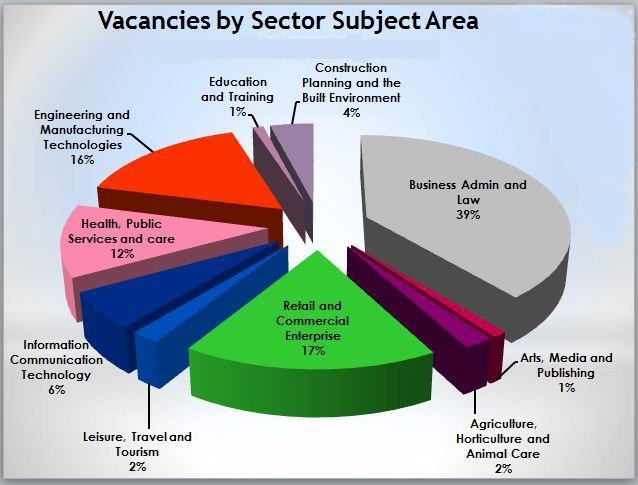 The size of the contribution from NAS varies depending on the sector and the age of the candidate. If the apprentice is aged 16–18 years old, they will receive 100 per cent of the cost of the training; if they are 19-24 years old, they will receive up to 50 per cent; if they are 25 years old or over they may only get a contribution depending on the sector and area. The remainder should be gained from the employer. The apprenticeship should not cost the learner anything.